Solvents can make you lose control… in a good way. I learned about using them with monoprints during my time at Penland School of Crafts. One of my biggest complaints about relief printmaking is that it is hard to have an image look painterly. You either have flat ink, some kind of blend roll, or layers of texture made by a rotary tool. Flow is something you rarely get with a relief print. 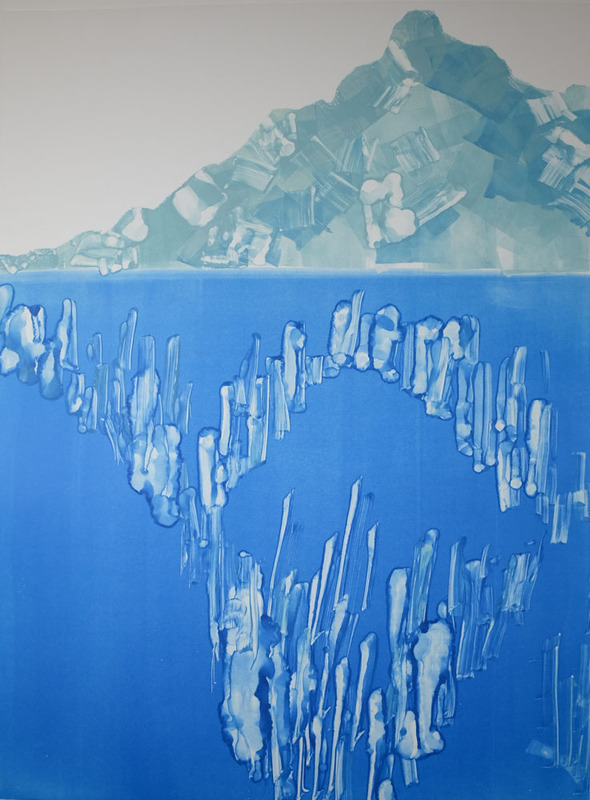 This iceberg was created by dropping mineral spirits onto a rich phthalo blue inked plate. This iceberg image was one of the first ones where I used solvent freely. I liberally dropped mineral spirits on a transparent layer of phthalo blue lithography ink. Using a Q-tip and a paint brush, I drew around the areas with the solvent, and then let the pigment disperse. If you have ever sprinkled salt crystals on wet watercolor, the effect is similar, but much more pronounced. Solvents are the Wild West on the monoprinting plate. Your inks can bleed into areas you didn’t intend, such as where the iceberg is now peaking out above the surface of the water. While oil-based ink can stay “open” — meaning you can work with it or wait to print for some time, when you put down the solvent, you are on the clock. I found that within 10-15 minutes, areas of my block had little pigment, and the surface appeared dry. When printed, you will see the white of the printing paper. Whether this is what you intended, or not. Delays also mean you lose some of the sharp details that solvents and brushes can create. Despite the challenges of solvents, I was determined to figure out a way to use them in my home studio. I don’t have adequate ventilation to use solvents in my basement, so I purchased a small metal office table at the IU Surplus Store and placed it outside, close to a door that leads to the basement. I can bring the inked plate outside, use Q-tips, brushes and toothbrush bristles to apply the solvent to the plate, and then rush the plate back inside to the press. Be careful to keep the plate perfectly level on the way to the press. Juicy solvent areas will run. I learned that the hard way. Gamsol moved the Gamblin relief ink well, but the ink itself transferred poorly from the plate to dry paper. Luckily I had some Hanco lithography inks, like those I used at Penland. Unfortunately, the Gamsol didn’t move this ink well at all. 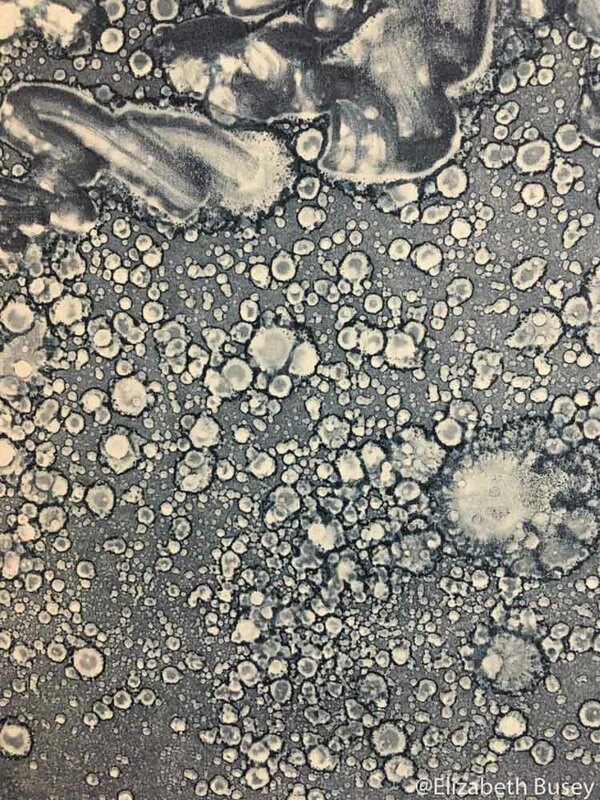 So I will need to continue using odorless mineral spirits on my monoprint plates, and reacquaint myself with litho inks. Gamsol wasn’t strong enough to move the lithography inks in the ways I wanted. 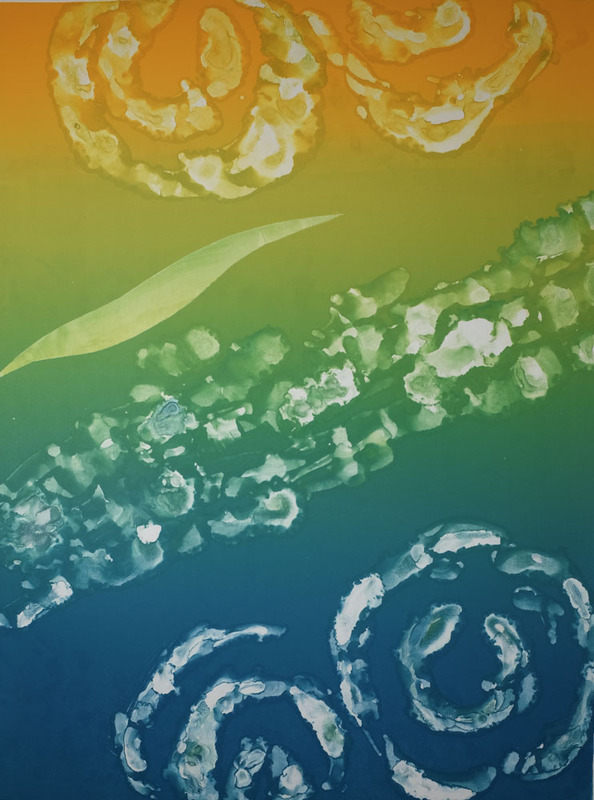 Here is a sneak peek at a multi-layered monoprint that I created using solvent and tape. Parts were successful, and parts went, well, squish. This entry was posted in Experimentation, Monoprinting, Techniques, Uncategorized and tagged flow, Gamsol, lithography ink, monoprinting, odorless mineral spirits, relief ink, solvent, texture on August 3, 2018 by Elizabeth Busey. I have Penland withdrawal. 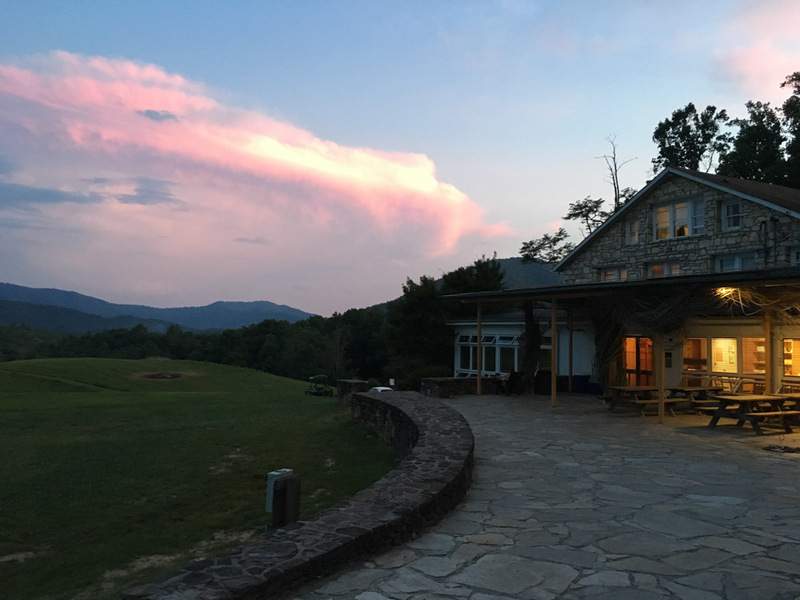 Penland School of Crafts is an artist retreat in the mountains of western North Carolina. It was originally established in 1929 to train local women to weave and market their products. Over the years it has evolved into one of the premiere craft schools, increasing its offerings to include media outside the traditional craft realm, including printmaking. Participating in a Penland summer workshop has been on my bucket list for some time, so when a monoprinting workshop showed up on the schedule, I signed up as soon as the application site went live. (Some of their courses are so popular that this is a very good idea.) For almost two weeks you are taken out of your normal routine to a stunning mountain campus. You are fed three meals each day, at which time you can chat with over 200 people who are there to make art, just like you. You can see a Youtube video about Penland here. The view of the mountains and The Pines, where delicious food and good company are served up in equal measure. 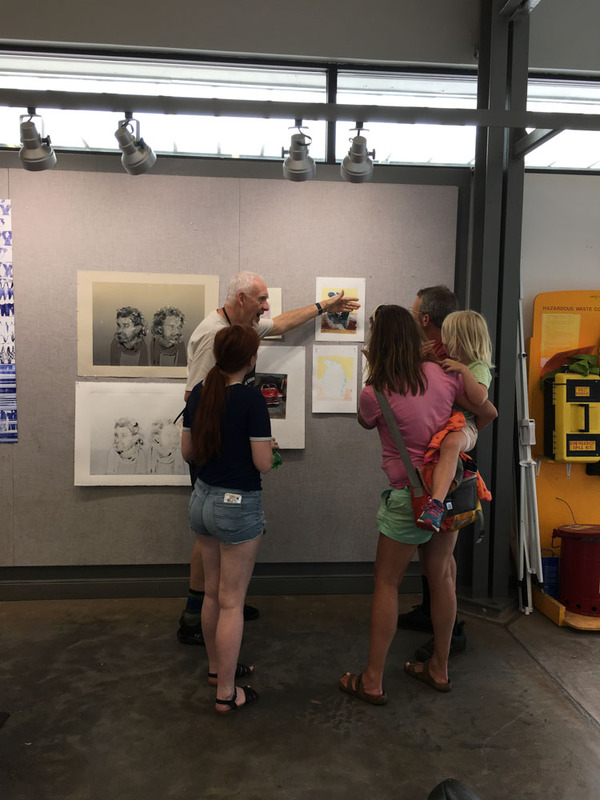 The monoprinting class was taught by Andy Rubin, who has extensive printmaking knowledge from his many years of teaching at various universities as well as serving as the master printer for Tandem Press at the University of Wisconsin, Madison. Along with studio assistant Jessica Merchant (MFA in Printmaking from UW, Madison), the class began with the basics of monoprinting and using Penland’s etching presses. Monoprinting was not covered in my classwork at Indiana University, so while I know my way around a press, the rest was completely new territory. 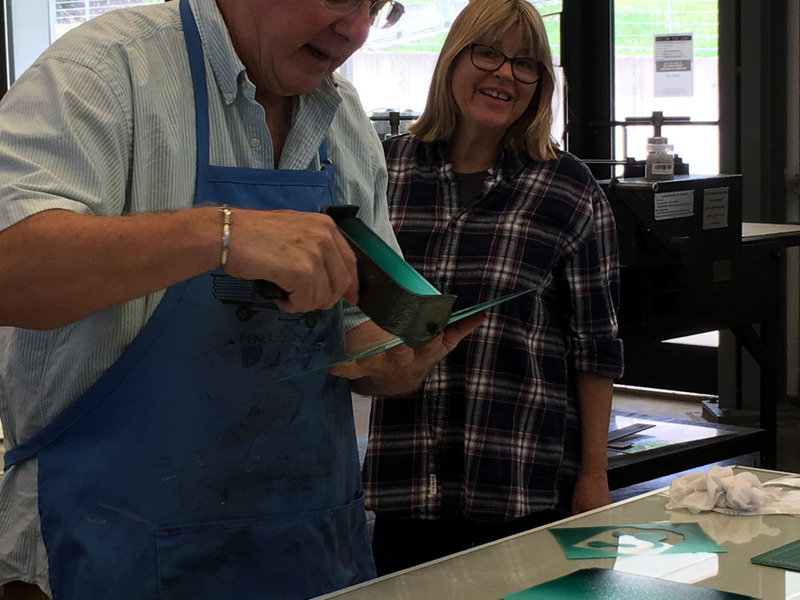 Andy Rubin demonstrates using a blend roll and stencils on the polycarbonate monoprinting plate, as studio mate Lisa Steffens looks on. This summer has been yet another in my life with many transitions. Adult children moved away and I completely changed how I have been showing my work. I felt strongly that I needed to push my work in new directions, and monoprinting seemed like a splendid way to do this. I was not disappointed. I learned new techniques such as stencils, ghost printing, and the use of solvent on ink. Others included painting directly on the plate, transferring drawing media, and creating a collagraph. Monoprinting can be fast or slow, depending on the techniques you choose. We had a wide variety of painters, printmakers and collage artists in the class, so someone was always doing new exciting work. Working in the studio was the perfect combination of demonstrations with lots of time to work in our own unique styles. Artists and other visitors would wander through the studios, and my classmates Kendall and Taylor were tremendous ambassadors for the printmaking tradition. Our studio of twelve had artists from seniors in undergrad programs to people who were embracing art in their retirement. I spent almost all of my time in the studio, so I was able to experience the differing energies of the morning printers, and those who found their groove towards midnight. Everyone brought such generous energy and good will to the studio each day. One of my first monoprints (18 x 24in) created with a large brayer, stencil, solvent, Q-tips and brushes. Did I mention this was my first experience with monoprinting? In the next set of blogs, I will show you some of my early works. I sarcastically call them “newbie art” but there is no doubt that learning something new as an adult can be humbling. The above work was made during my first evening studio session after a day of introductory demos. I chose Phthalo Blue and a warm yellow lithography ink and created a huge blend roll. I cut stencils out of mylar (the small swooping shape) and tried out using mineral spirits to move the ink around on the block with both q-tips and brushes. While the movement was quite interesting, I wanted to use the techniques more intentionally. 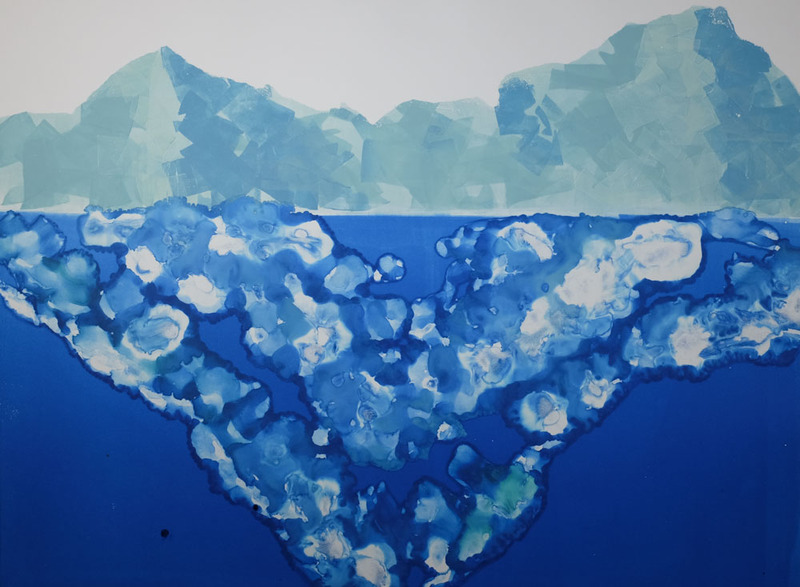 Opaque and transparent inks, plus brayers, paper daubers, solvent and masking tape created my first iceberg. More to come? My next series dealt with icebergs. 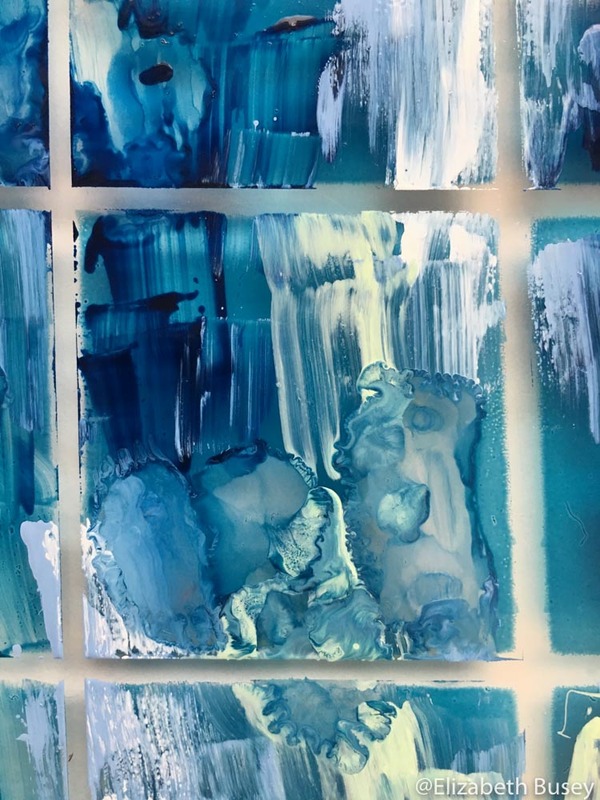 Above the waterline, I used opaque inks (pigment mixed with white) and a brayer to create the ice. Masking tape defined the edges of the iceberg top, and was removed before printing. 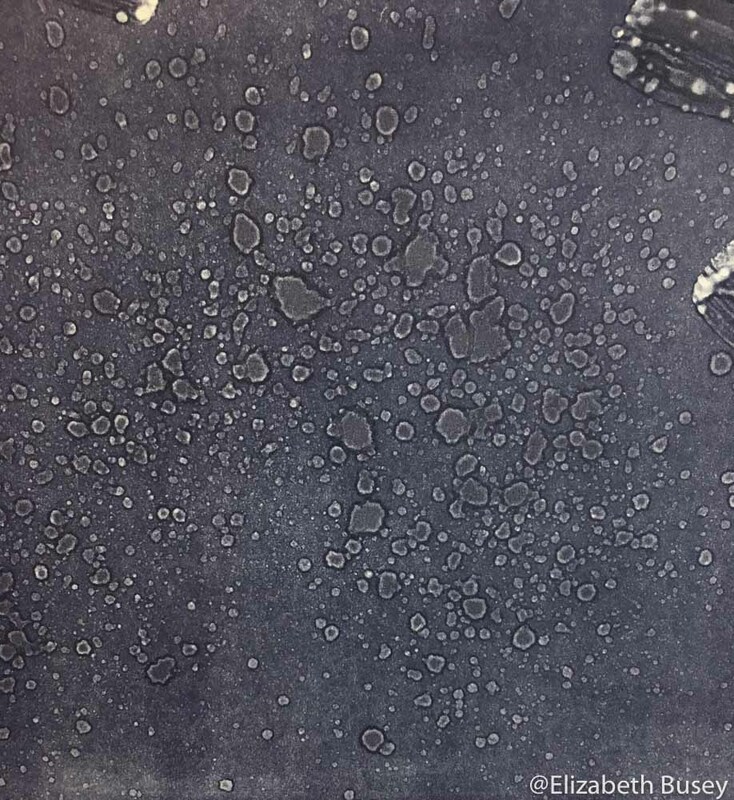 The underwater portions were created by dragging a dauber of folded printing paper through the transparent phthalo blue, displacing some of the ink. I quickly used some solvent in a more judicious manner before running everything through the press. Clearly re-entry into normal life is going to be rough. Suddenly I am in charge of meals once more, plus the myriad of other chores that life entails. I can now receive phone calls and texts again, and it is much harder to achieve that groove that Penland can give you. Further blogs will talk more about solvents and my new love — masking tape. Stay tuned. By the way — what’s for dinner? 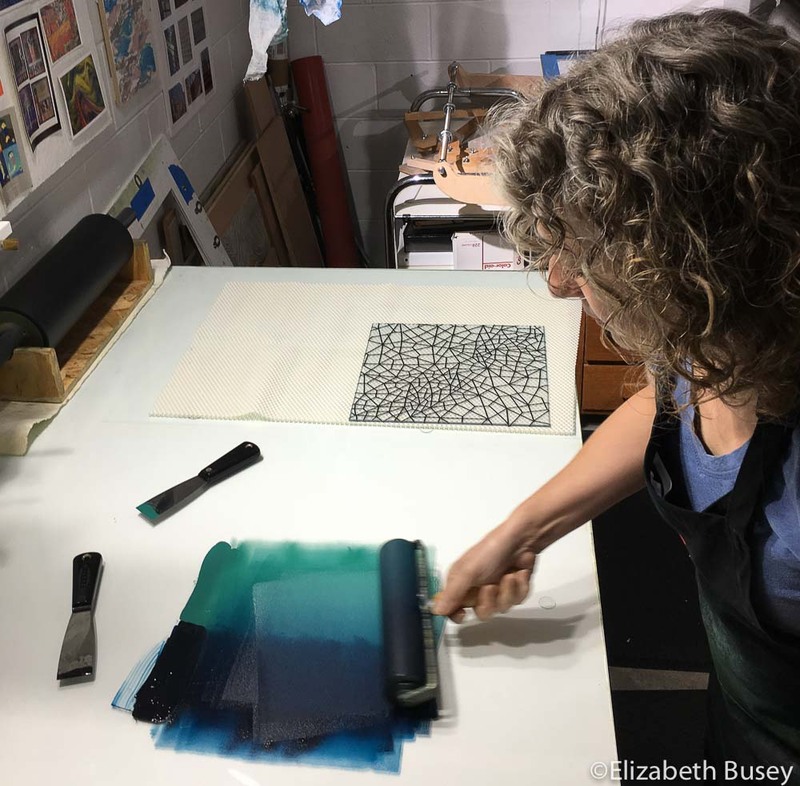 This entry was posted in Inspiration, Monoprinting, Uncategorized, Workshop and tagged monoprinting, Penland School of Crafts, printmaking, workshop on July 27, 2018 by Elizabeth Busey.